Should You Use a Videographer During Your Wedding? The biggest day of your life is drawing near – and you can’t wait to share your special day with your family, friends, and loved ones. You have the wedding gown, you’ve tasted dozens of cakes, and you even have the menu selected for your reception. All that’s left is to hire the photographer – and you can’t wait to meet the person who will be documenting your most precious memories. But before you contact potential photographers, there’s something weighing heavily on your mind. You know you definitely want to have someone taking pictures at your wedding – but should you also hire a videographer too? A videographer is someone who records video footage of your entire wedding, from the first moments when you step down the aisle until long after your uncle gives that embarrassing toast at the reception. It can be a great way to preserve even more memories of your wedding, but it can also come at a considerable expense. 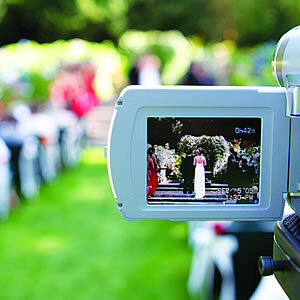 With this in mind, let’s take a look at whether you should use a videographer during your wedding. One of the biggest advantages of using a videographer is that you’ll get the opportunity to capture your entire wedding live and in action. While photographs may represent an excellent way to capture the feel of a wedding, only a videographer can capture the words of love and devotion that are shared throughout the entire day. Additionally, videographers often turn their footage into DVDs, so you can send a copy of your wedding DVD to friends and relatives who were unable to make your wedding. Finally, many videographers offer a discount if you hire them along with a certain photographer. If you’re intent on using one, it can be a great way to save considerable money on your wedding budget. One of the biggest disadvantages of using a videographer is the expense. Videographers don’t come cheaply, especially if they don’t offer discounts in conjunction with your photographers. Therefore, if you’re not sure if you want to hire a videographer, this disadvantage alone may be enough to sway your opinion. There are other additional expenses to using a videographer, as you’ll may also be required to provide him or her with food and beverages throughout your wedding. No matter what you decide, be sure that you select a videographer who can truly capture the unique look and feel of your special day.